Alessandro de’ Medici, called “Il Moro” (“The Moor”), was born in the Italian city of Urbino in 1510. His mother was an African slave named Simonetta who had been freed. Alessandro’s paternity is uncertain. Most sources name Lorenzo de’ Medici, ruler of Urbino. But Alessandro might also have been the son of Pope Clement VII, the brother of Lorenzo II who became the head of the Medici family after Lorenzo’s death. Clement VII chose the nineteen-year-old Alessandro to become the first Duke of Florence in 1529. Pope Clement at that time was at odds not only with the Florentines who had driven out the Medici family in 1497, but also with the emperor Charles V. To solidify the allegiance that the papacy owed to the Holy Roman Empire, Alessandro was named Duke of Florence and promised the emperor’s daughter Margaret. With the help of Charles V, Clement could restore the rule of the Medici family in Florence in 1530 and make Alessandro the first reigning Duke. Supported initially by the best families, Alessandro became an absolute prince, overthrowing the city’s’ republican government. According to most historians the young duke’s reign did not begin very well. His arrogant personality, the bad behavior of his entourage, and his licentiousness — with both women and feasting — soon gave Alessandro an unsavory reputation. In addition, he made some highly unpopular political decisions including limiting the number of remunerative positions in his government. This decision alone forced many patrician families to go into exile and become enemies of his rule. T.F. Earle and K.J. 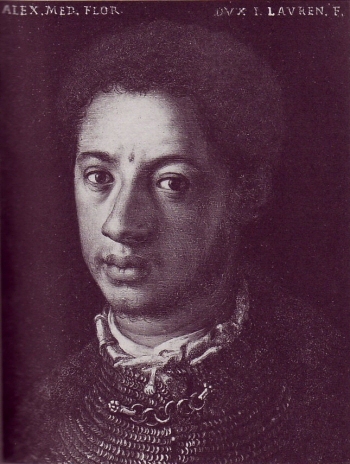 Lowe, Black Africans in Renaissance Europe (Cambridge: Cambridge University Press, 2005); J.A. Rogers, World's Greatest Men of Color, Volume II (New York: Macmillan, 1972). T.F. Earle and K.J. Lowe, Black Africans in Renaissance Europe (Cambridge: Cambridge University Press, 2005); J.A. Rogers, World’s Greatest Men of Color, Volume II (New York: Macmillan, 1972).